Class visits are welcome at Beckley Furnace!! We’re Connecticut’s only designated Industrial Monument, and we’re also the centerpiece of Housatonic Heritage’s Iron Heritage Trail. So, it’s our responsibility to pass along this heritage and knowledge to future generations. One way we do it is by welcoming student and camp groups as visitors. More about the facility itself is here. 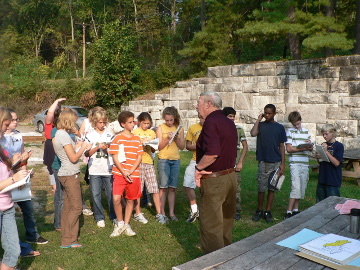 Our experience is that kids find their school or camp visit to Beckley Furnace to be both instructive and fun. Often parents come along as chaperones, and usually they report that they have both enjoyed the visit and learned something about our area and its industrial past as well. –The more the kids know in advance about Beckley Furnace, iron making, and the history of the area, the less overwhelming the trip is and the more the kids learn. While the teacher arranging the trip will likely prepare the students beforehand, we encourage you to discuss these topics in your home both before and after the visit. –Young people usually like to know how what they are seeing might be connected with something they are learning about in school or extracurricular activities, or other interests. Our Connections to Learning page provides some linkages you might find useful. –We know that kids are particular about what they wear. However, since many will want to explore the slag heap, which contains colorful (and SHARP) slag fragments, we recommend long pants to help avoid cuts. Watch our video about slag at Beckley Furnace. –Be sure to let us know what your kids thought of the trip afterwards! Feedback makes us better at what we do. Here’s an easy way to open communications with us about a possible future visit!